Cayman Diving provides the ultimate dive experience right from the beautiful shores of Grand Cayman. Not only is Cayman Dive School 5-Star rated with our terrific instructors, we’re also 5-Star rated with our fabulous service. Our goal is to give you the best diving experience, best training, and best personalized service possible. Grand Cayman is a nirvana for scuba divers from all over the world. The island’s magical underwater world rose to fame in the early 80’s and has remained a popular diving destination due to its year-round excellent conditions and accessibility. Each side of the island offers something different underwater with each coast showing off unique and beautiful scenery and all sorts of fish and wildlife. From the west side’s underwater tropical paradise, to the North Wall’s iconic Tarpon Alley, Eagle Ray Pass, and Hammerhead Hill, to the Kittiwake there’s a dive in Cayman for everyone. Stingray City in Grand Cayman is famous the world over and deservedly so. You can visit these friendly creatures at the sandbar or at a shallow dive site just a short trip along the barrier reef. Dive groups are limited - average is 3-4 on most dives - which means no crowded boats or dive sites. This is perfect for small groups who want their own boat and instructors. We love to dive, so if you’re taking classes consider a dive package as well. We can take you to wonderful wreck dives, wall dives or Stingray City dives. We dive the North, West and South sides of the Island. Book now or call the crew +1 345 916 8487. 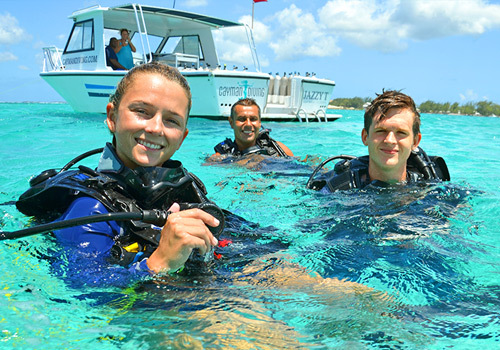 Cayman Diving School has been teaching diving for more than 30 years. From your first time underwater to advanced, technical or speciality courses, we've got you covered. A great way to try diving is the Resort Course or Discover Scuba Diving Course. A PADI Dive Instructor will go over a short information session and a shallow water practice session (3-8 ft) with you before you go on your dive. In this shallow water practice session you have the chance to try the gear, do a few practice skills and get comfortable before the dive. On the dive you will see many colorful fish and wonderful creatures. As a resort diver your depth is limited to 40 feet. If you really enjoy yourself and would like to dive again, you don’t need to repeat the theory and shallow water session. However you must always dive with an instructor and you are limited to 40 feet. If you decide that you’d like to continue to become a Certified Diver then you can credit your resort dive toward your Open Water Course. If you’ve never tried diving before or you have been resort diving and want to continue on, this course will certify you as a PADI diver to dive anywhere in the world. The course theory is now completed online. See eLearning for details (Private theory sessions can be arranged if you prefer). The Open Water Course includes shallow water training sessions and four Open Water Training Dives in the ocean. The course takes approximately 1.5 to 3 days, depending on which course option you select. If you don’t have a lot of time or would like to spend more time diving once you are certified, you can take the referral program. This allows you to complete the theory and pool portion of the course right at home at a dive shop near you. Your Dive Instructor there signs Referral papers for you to bring to us. We do the training dives for you here in our nice, warm, clear waters. You’ll complete four training dives over two half days. The PADI Adventure Diver program is the first step beyond Open Water Diver Certification. It’s a great way to explore other diving interests such as night diving, underwater photography and many other exciting dive activities. Once you’re comfortable with the basic skills, Adventure Diver helps you journey into diverse environments and experience new adventures. Adventure Diver consists of three dives. These three dives may be done together or one at time. All of these dives can be credited toward both the Advanced Diver and Specialty Diver Courses. The PADI Advanced Diver program can follow the Open Water or the Adventure Diver. It’s a means to explore other diving interests and improve your diving skills. The program consists of five dives, three elective dives and two core dives. The two core dives include the deep dive and the Navigation dive. The elective dives are fun and exciting dives that may be selected from the list below. The Advanced dives may also be credited towards the Specialty Diver programs. Divers take the Emergency First Response courses to meet program prerequisites, such as PADI Rescue Diver, or as preparation for becoming a PADI Divemaster. However, most have also found the EFR program to be important in everyday life. They have taken a significant step in emergency preparedness, and feel confident that they can provide care should an emergency situation arise. The Emergency First Response program meets requirements for CPR and First Aid in the workplace and incorporates the latest procedures for emergency patient care. Specialty courses are a great way to refine your skills and define the kind of diver you are. The more time you spend honing your skills and having fun underwater, the more opportunities you'll have to make discoveries of your own. The Purpose of the PADI Specialty Diver courses is to familiarize divers with the skills, knowledge, planning, organization, procedures, techniques and problems for various special interest areas in diving. There are many specialties to choose from. If you complete a minimum of five specialties areas then you are almost qualified to achieve a Master Scuba Diver certification. PADI's highest non-professional diver rating which denotes superior achievement. Learn all the names of the beautiful tropical fish and their characteristics. Learn how to dive from boats of all kinds. Learn Different parts of the boat, VHF radio usage, gear requirements and safety practices. Explore the wonders of the deep. Learn techniques for diving in the deeper depths of 60-130 ft. Learn how to extend your dive time and stay down longer while getting the chance to see more of the underwater world. Learn how to use a dive computer and keep track of your decompression times safely. Dive at night and see a whole new cast of critters that you don’t see during the day. What a wonderful experience. Nothing like you can imagine. Neutral buoyancy is the key to conserving your air consumption and leaving minimal impact on the aquatic environment. Learn how to achieve neutral buoyancy with ease. Enjoy your diving more! Have you ever dropped something in the water? Are you looking for lost ‘treasure’? The PADI Search and Recovery Diver Specialty course will teach you effective ways to find objects underwater and bring them to the surface. Small, large or just awkward, there is a way to bring them up. Look closer to see more on your next dive. Look for symbioses, predator/prey and other relationships between aquatic plant and animal life. Learn not just what fish and animals are, but how they interact with each other and the environment. Learn about why some creatures behave the way they do and what their role is in the aquatic ecosystem. Learn to take pictures of the wonderful things you see underwater to show your family and friends. The PADI Enriched Air Diver course is PADI’s most popular specialty scuba diving course, and it’s easy to see why. Scuba diving with enriched air Nitrox gives you more no decompression dive time. This means more time underwater, especially on repetitive scuba dives. You can typically stay down longer and get back in the water sooner. With more people learning to dive using the PADI system of diver education than with any other recreational scuba programme, it’s no wonder that PADI professionals are the most sought after dive leaders in the world. Just imagine leading a life others only dream about. Whether you work in a local dive centre, at a resort in a tropical dive destination or on a live-aboard dive boat, the adventure of a lifetime could be yours. You will also enable others to enrich their own lives through the experience of diving. To work as a PADI Professional start by taking the PADI Divemaster course and work your way up to the PADI Instructor level. PADI’s Instructor Development Course (IDC) and Instructor Examinations (IE) redefine the standard for instructor training and assessment, and coupled with state of the art educational materials, is the most comprehensive program in the world. CPR and first aid are important skills that are in high demand. As an Emergency First Response Instructor, you can teach these skills to anyone. Teach CPR and first aid to others so they can be prepared for an emergency. Looking for the first step in working with scuba as a career? Your adventure into the professional levels of recreational scuba diving begins with the PADI Divemaster program. You will be working closely with a PADI Instructor, in this program you expand your dive knowledge and hone your skills to the professional level. PADI Divemaster training develops your leadership abilities, qualifying you to supervise dive activities and assist instructors with student divers. PADI Divemaster is the prerequisite certification for both the PADI Assistant Instructor and PADI Open Water Scuba Instructor certifications. During the PADI Divemaster program, you learn dive leadership skills through both classroom and independent study. You complete water skills and stamina exercises, as well as training exercises that stretch your ability to organize and solve problems as well as help others improve their scuba. You put this knowledge into action through a structured internship or series of practical training exercise.